I am a mother of four (two boys and two girls) and a parenting coach who helps moms identify and break toxic parenting patterns. After working as an educator and instructional coach for over 15 years, I decided to use my teaching skills and my curriculum design skills to create programs that provide parents with clear, easy-to-implement techniques to become more positive, purposeful and effective parents! Through my parenting programs, high-energy workshops, online challenges, and 1-on-1 coaching, I have helped countless parents across the Unites States navigate the everyday challenges of life with kids using proven, research-based strategies. I am passionate about building a community of women who are committed to challenging popular parenting norms as they groom their children for success in a loving, peaceful, and respectful home environment. Domari Dickinson is a parenting coach who has worked with school districts, school leaders, teachers, parents and educational companies from across the country to help students be more successful. She received her B.S. in Mathematics and B.S. in Computer Science from Spelman College in 2002 and her Master’s degree in Computer Science from Johns Hopkins University in 2003. Domari has dedicated over 15 years to supporting the education of inner-city students and her passion for teaching both children and adults has been evident both inside and outside of the classroom. She was the first teacher to receive theTeacher of the Month award at the Academy for College and Career Exploration in Baltimore, MD in September of 2007, and she received this award again in September of 2010 while working at True North Rochester Prep in Rochester, NY. Domari began her career as an educator as a founding teacher with the Academy for College and Career Exploration in Baltimore City Public Schools. Over the course of her time with the school, she taught Pre-Algebra, Algebra I and Geometry and also served as the Lead Mathematics Teacher. In this role she assisted in developing and analyzing daily lesson plans and unit assessments, organizing and delivering professional development for teachers both school- and district-wide, and supporting teachers in analyzing their assessment data. 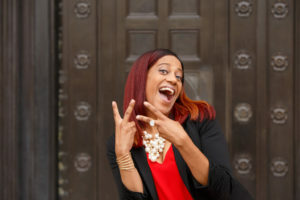 In 2007 Domari became a Certified Implementation Specialist for Carnegie Learning, Inc. after using their curriculum with her students, and this opportunity allowed her to train and support teachers across the country in the successful implementation of the curriculum and computer software. That year she also worked for CompassLearning Inc. where she created over 50 videos to help support the Odyssey High School Algebra product, and these videos continue to help students around the country to meet with success in their Algebra classes. In 2008 Domari relocated to Rochester, NY to take a position teaching 7th grade mathematics at True North Rochester Preparatory Charter School. In this position she developed a 7th grade mathematics curriculum that was directly aligned with NY Sate standards. During her first year she was responsible for teaching data driven lessons based on interim exam results and daily formative assessments. During this year she became the first person in the history of the school to have 100% of her students score proficient on the NY State Math Exam. In 2009 she became the Grade Level Chair at Rochester Prep which allowed her to train team members in the areas of curriculum implementation and classroom management, provide professional development support and feedback, lead grade level meetings and serve as a liaison between team members and the school administration. While working with Uncommon Schools in New York, Domari had the opportunity to work directly with Doug Lemov and as a result she was featured in the book/DVD “Teach Like a Champion: 49 Techniques that Put Students on the Path to College” modeling exemplary instructional practices. In 2010 Domari returned to Baltimore to take a position as an Instructional Specialist with Friendship Public Charter School. In this role she provided professional development to teachers and leadership teams to help improve student outcomes across grades Pre-K to 12. In 2013 she transitioned into the role as the Director of Mathematics with Friendship schools. Along with providing targeted and specific feedback on lesson plans and informal observations, she also had the pleasure of co-planning, co-teaching, and modeling for teachers. While working with Friendship, Domari was also able to provide Real-Time Coaching to elementary, middle and high school teachers to help them decrease off-task behaviors in their classrooms. Over the past ten years Domari has also worked as an independent contractor with companies such as Words & Numbers, Carnegie Learning, CompassLearning, Lincoln Learning Solutions, and ChallengeU. She has also provided services for the Ready at Five organization as a coach for both their VIOLETS and mathematics programs which help ensure that young children have the skills needed to help them be successful when they enter kindergarten. In 2017 Domari launched Positive & Purposeful Parenting and is now working to help equip parents with the knowledge, tools and support they need to ensure that they are grooming their children for success. She runs virtual challenges, live workshops, and provides 1-1 coaching programs to help break toxic parenting patterns and help parents clearly define success for their family AND come up with a plan to achieve it! Are You Ready for Some Random Facts? If this is your first time on my page, then you’re probably wondering, “Ok. Who is this crazy lady with the bright red hair?” Well, to give you a little more insight into my world, I’ve decided to compile a list of 51 random facts all about me….enjoy! 13. I also hate when the time on the microwave isn’t actually the time but the amount of time remaining from the last person’s attempt to re-heat some food. It drives me NUTS!!! 34. I watched the entire series of Flashpoint on Netflix in under 2 weeks…..that show is sooooo freaking good!! 51. I played volleyball in college but had to stop due to a shoulder injury….10 years later I tore my ACL playing volleyball at a church picnic. Although I really love it, clearly volleyball is not good for my health.